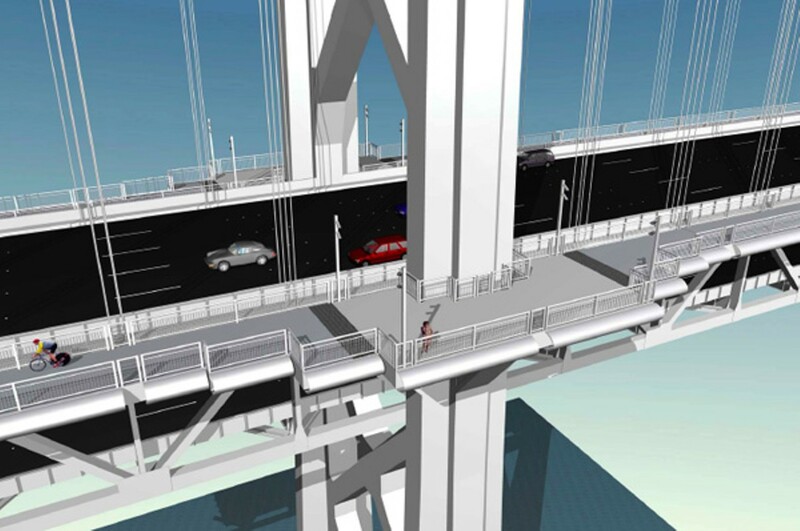 MTC and Caltrans are proposing a bike and pedestrian pathway along the western span of the Bay Bridge. But will it find funding? Biking all the way to San Francisco is under consideration. Fantasies of bicycling and walking between San Francisco and Oakland along the Bay Bridge are slowly inching their way toward reality. The Bay Bridge Bikeway Project, a joint venture between the Metropolitan Transportation Commission and Caltrans, hopes to allow bicyclists and pedestrians to travel between the two cities along the full span of the bridge. If approved, MTC officials said it would be the largest engineering feat of its kind in history. 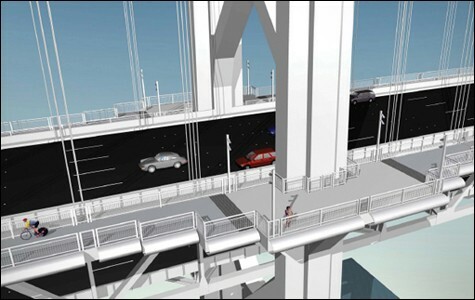 The forthcoming completion of the eastern span already includes a fifteen-and-a-half-foot-wide elevated pathway on the south side to allow bicyclists and pedestrians to ride and walk to Yerba Buena Island. The pathway won't extend to the western span, which would allow folks to make it to San Francisco. But that may change, as the MTC is currently working on a project study report for release early next year that officials hope will jump-start planning for a western pathway and put the project on the radar for funding. The MTC study revisits and builds upon data gathered for a 2001 Caltrans study, which examined the feasibility of adding cantilevers on both sides of the western span's upper deck to accommodate bike and pedestrian traffic. However, a decade's worth of development changes on the San Francisco touchdown side of the bridge's potential bikeway have caused the MTC to rethink the designs for the approach into the city as well as the cantilevers themselves, according to MTC Project Manager Peter Lee, who's in charge of the study. According to Lee, the 2001 study had the bikeway's San Francisco touchdown in the Rincon Hill area, but the area has changed so dramatically over the last decade that the designers and engineers are now looking into a single pathway along one side of the bridge's upper deck instead of the proposed two — an alternative that may prove to be cheaper as well. Lee says the initial feasibility study also didn't include enough analytical work on the approaches and touchdowns, which prompted the current project study report. The western suspension bridge is lifted 220 feet above the water, which makes the touchdowns even more challenging in San Francisco, said East Bay Bicycle Coalition Project Manager Dave Campbell. "How do you get people down from that height and get them down safely?" he asked. The biggest structural challenge of the $1.2 million MTC study, Lee said, is figuring out how to add a structure alongside the bridge between San Francisco and Yerba Buena Island. He pondered how to manage staging equipment for the construction as well as how to handle traffic delays. "No one's ever done this before," he said. "Typically, people just build a new bridge." However, Lee said, building an unattached bikeway alongside the existing 2,310-foot western span is not an option, mostly because it would distort the bridge's image. In 2001, preliminary funding priced the bikeway project on the western span at between $160 and $390 million for two alternatives that varied only slightly in design. The cheaper of the two involved adding two pathways on both sides of the span while using suspender cables to lift them. The more expensive alternative suggested adding two pathways but replacing the lower concrete deck with lightweight steel to minimize refraction. Today, Lee estimates that the project will cost half a billion to a billion dollars. "Half a billion dollars — that's a whole bridge somewhere else," Lee said. But funding is truly the biggest obstacle. While there is currently no source of funding for the western bike pathway, the MTC and Caltrans are eyeing increased bridge toll revenue as one way to help fund the project, says MTC spokesman John Goodwin. "There's no cheap way in finding funding to shoehorn something into a 75-year-old structure," he said, adding that it's very rare to receive one pot of funding for a project of this caliber. Getting funding from the Bay Bridge toll increase has been a rollercoaster ride at best, said Campbell. In 2009, the bicycling public was in an uproar after the Bay Area Toll Authority, which acts as an MTC oversight on all Bay Area bridge toll revenue, was told by its lawyers that it did not have the right to allocate toll profits toward the bikeway project. In response, Senator Loni Hancock introduced SB 1061 in February, which asked for toll-increase revenue to be used for the construction of a bridge maintenance pathway alongside the western span. The current law, according to Hancock's proposed legislation, states that the toll authority is authorized to use toll monies for capital projects involving planning, construction, and maintenance of the authority's bridges. The pathway would, in turn, double as a bicycle and pedestrian cantilever. However, because state legislators were unable to pass a state budget on time, the bill was held in the Assembly Appropriations Committee in August, which effectively killed the bill for the current legislative session. Now it will need to be reintroduced next year. In the meantime, the MTC and Hancock requested an opinion and clarification by the State Assembly's Legislative Council on the MTC's authority to allocate toll funds for the bikeway. The Legislative Council concluded that any leftover toll revenue from the current construction and retrofitting project of the eastern span can be allocated for the bikeway project, Campbell said. He added that the opinion stated that most of the revenue generated from the toll increases over the past ten years can be used to fund the pathway on the bridge. However, the Legislative council stipulated that any qualifying project can potentially obtain leftover retrofitting funding from toll monies. The bikeway project is just one of many others vying for toll revenue funds, Campbell said. He added that even though he believes Caltrans and the MTC are going under budget on building the eastern span because construction bids have been low, he doesn't expect there to be much leftover once the retrofit money is spent. Toll revenue for the bridge exceeds $1 million daily, with a quarter of a million people crisscrossing the bridge every day, according to the toll authority. So far, Lee said, there's been no opposition to the bikeway project, just an inability to fund it. If there's any retrofit money left for the bikeway and maintenance pathway, then some funding will come from commuters. "People love it," said Lee about the pathway. "When they don't have to pay for it, they're always for it." San Francisco's recent purchase of Treasure Island and the city's development goals have created another incentive to expedite a bikeway project on the western span, said Campbell. The Treasure Island Development Agency and Planning Department will erect 8,000 housing units with 300,000 square-feet of commercial space and 300 acres of parks according to the agency's fifteen-year plan. "It makes no sense to build 8,000 homes on Treasure Island and not give them a way to walk or bike into the city," Campbell said. The desire to put a pathway on the suspension bridge may come down to "political feasibility," says Goodwin. Will the demand for a bikeway meet the threshold that makes it a financially desirable project? Bay Area residents' demand to ride into San Francisco from their East Bay dwellings and vice versa will have to be strong enough to push the project to fruition, he said. Why pedestrian and walking lanes weren't added during the bridge's construction evades him, he said. "They should have done it in the 1930s." Once the East-Bay-to-Yerba-Buena-Island span is completed, projected for late 2013, it will be another six months to a year before eastbound traffic will be allowed through because of the alignment of the old bridge's Oakland approach in correlation to the touchdown of the new bridge, according to Caltrans spokesperson Bart Ney. Bicyclist and pedestrians will suffer the same delay since their pathway is attached to the eastbound lanes. The next step for the bikeway project is to reintroduce Hancock's legislation in hopes that a funding source can be locked down, said Campbell. Even if funding was attained and approved, however, it would be close to a decade before the start of construction, Lee said. Beer-only taverns appeal to drinkers searching for a bargain.